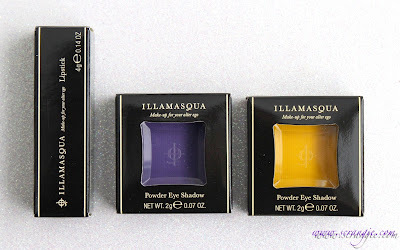 Illamasqua has just introduced phase two of their Spring/Summer 2012 Human Fundamentalism collection. The new additions to the line include two new lipsticks (Eurydice and Liable) and four new powder eyeshadows (Hype, Inception, Fledgling, Vapour). 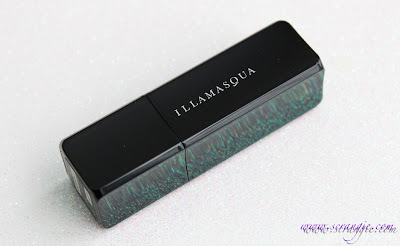 You can see the entire Illamasqua Human Fundamentalism lineup here, and I have a few swatches to post below. 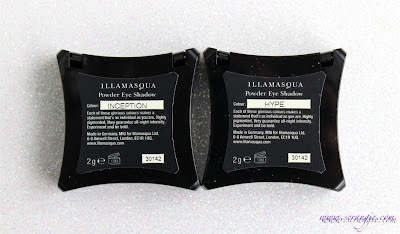 New Illamasqua shades: Lipstick in Eurydice, Powder Eyeshadow in Inception and Hype. 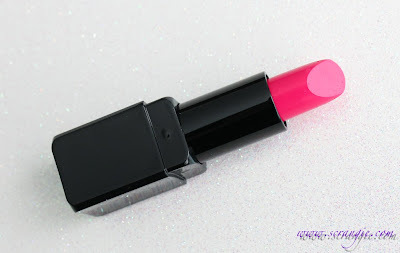 Eurydice is a bright matte fuchsia. It looks nearly neon in the tube, but it tones down a little once it's on the lips. It's not completely full coverage, but does provide a ton of color. 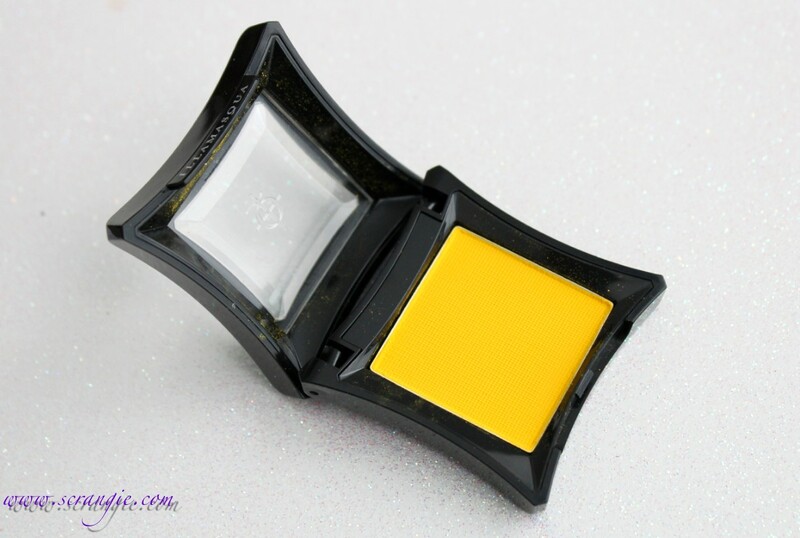 It is a matte formula with no shine or shimmer and the texture is very dry. 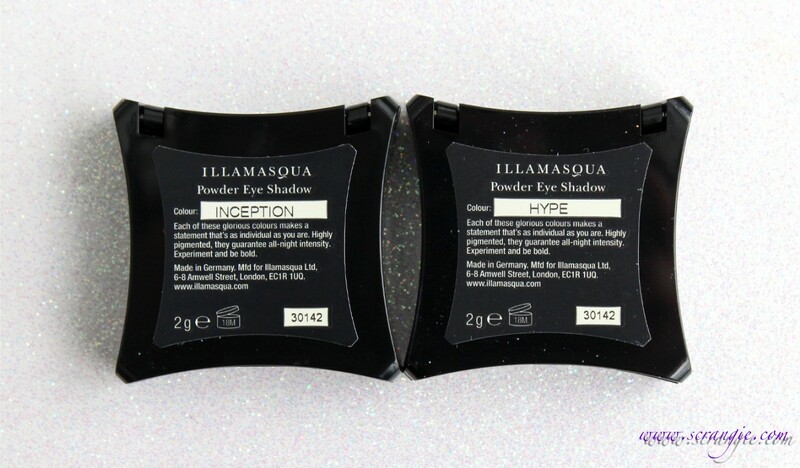 Illamasqua Powder Eyeshadow in Inception (left) and Hype (right). 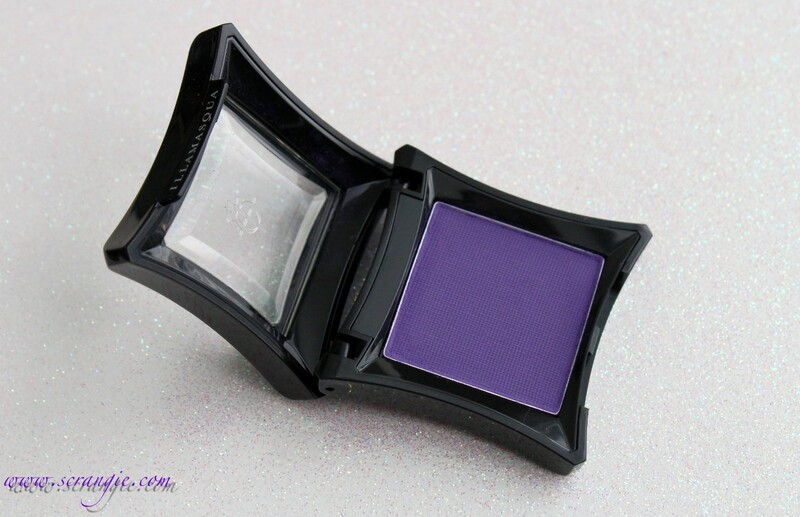 Inception is a sheer matte purple. It leans toward the blue side of purple. 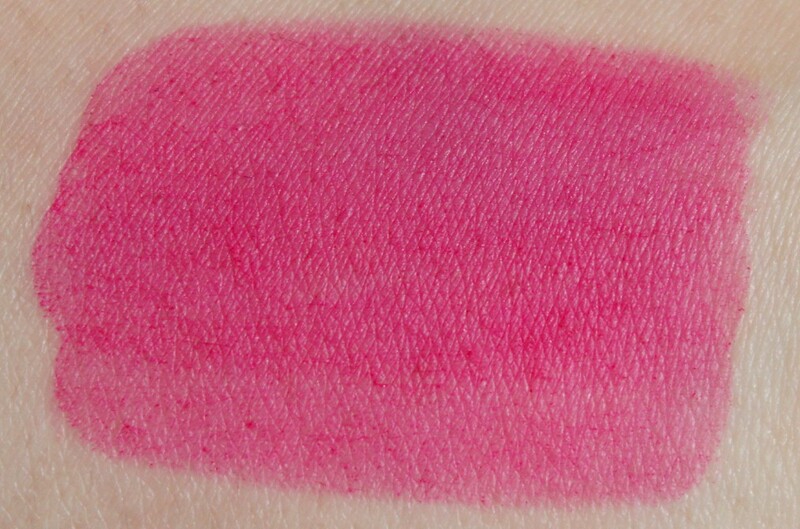 It appears more clean and bright in the pan, but on the skin it has a very dusty/dirty/faded look. 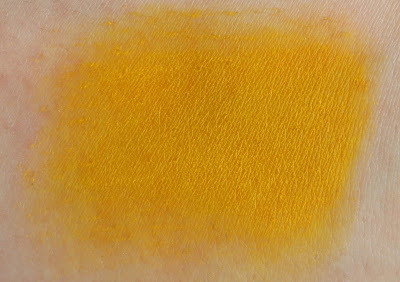 Hype is a sheer medium yellow matte. Like Inception, it seems rather bright and clean in the pan, but on the skin it take on a muted/faded/dusty looking finish. I always love Illamasqua's packaging. It looks sleek and elegant with a hint of Gothic edge. Love the bright color of the lipstick. The two eyeshadows were disappointingly sheer and chalky. 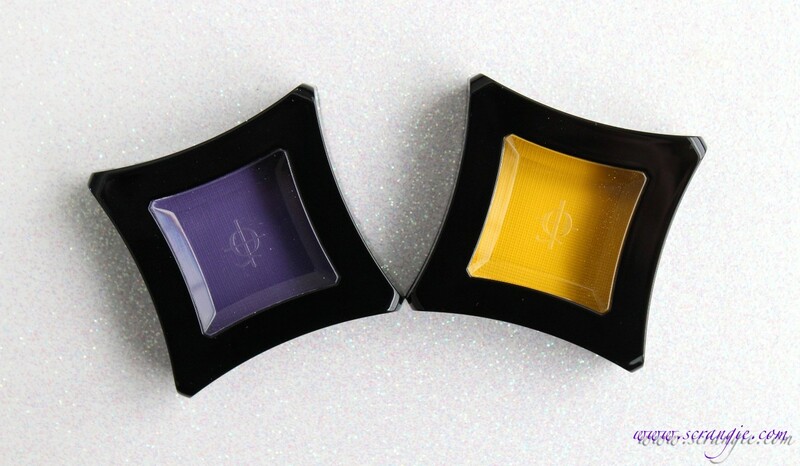 I was never able to make them fully opaque on their own (over my usual eyeshadow base) and they did not blend well. Both colors also fade rather quickly after they're applied, which is not something I normally experience with powder eyeshadows. The lipstick is extremely dry and feels uncomfortable on the lips. The dryness of the matte formula accentuates flaky skin on the lips, so it's best to exfoliate before applying and then wear a balm on top. 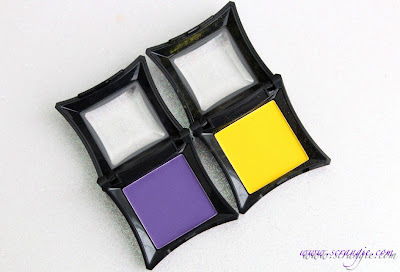 The eyeshadows were, sadly, quite problematic for me, but that's usually the case with matte purples and yellows so it wasn't entirely unexpected. 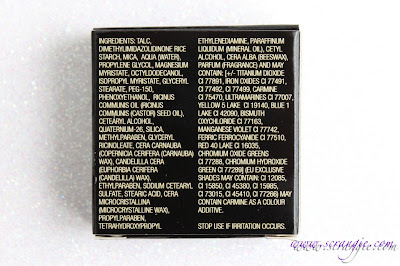 Hype and Inception might perform better when applied over an opaque white base (such as NYX White Eyeshadow Base), but I was not able to get them to work for me on their own over my usual eye primers (Too Faced Shadow Insurance and Urban Decay Eyeshadow Primer Potion). If you're looking for an easier to use matte purple or yellow eyeshadow, you may have better luck with MAC Chrome Yellow and Make Up For Ever #92. 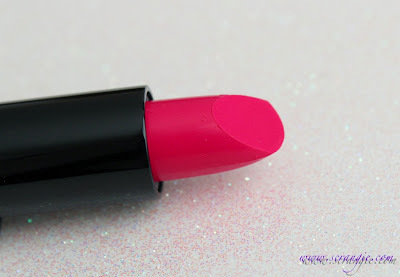 The color of the lipstick was bright and gorgeous, but the dry formula was uncomfortable to apply and wear. 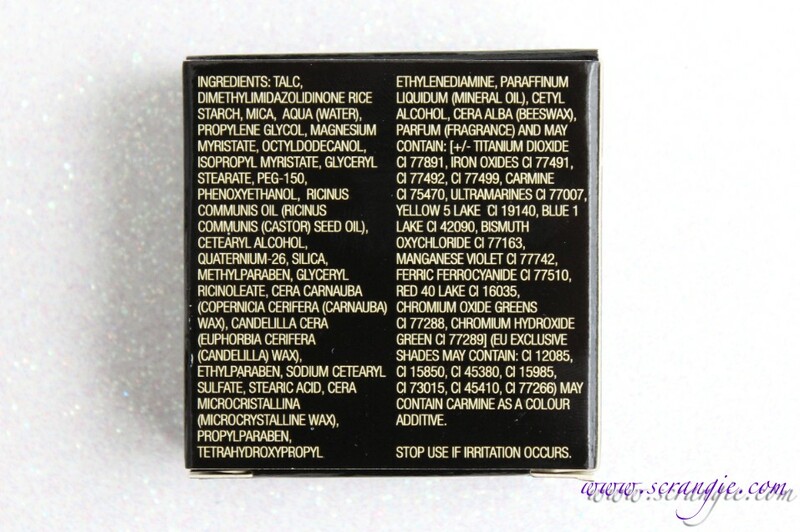 This is eliminated by using lip balm before or after application, but the balm takes away the nice matte finish of the lipstick and also reduces wear time. As I'm sure you know... we like to break rules, which is why are now breaking the unspoken prejudice of age with a revolutionary casting call! We are looking for beauty without limits – age limits, beauty has no sell-by date. That’s why our new campaign will feature people of all ages... Our professional products and brand ethos are transcendent of age; anyone can self-express, be empowered and feel beautiful with bold make-up, so if you’re someone who never lets age define you, or you know someone who fits that description we want to encourage you to nominate your mothers, aunts, grandmothers or any strong person in your life to be part of our next campaign in a glamorous beauty shoot celebrating all ages and diversities. As well as individuals, we are looking for pairs – from mothers, fathers, sons and daughters, nieces, nephews, aunties, uncles, grandmothers and grandsons. The combinations are endless! Nominate yourself or someone else at www.illamasqua.com/beauty-before-age before May 15th 2012, and if chosen you and/or that person would need to be available to attend an open casting mid-May 2012 and be part of the shoot taking place in London on Wednesday May 23rd and Thursday May 24th 2012 - competition is open internationally! In return, all those featured in the campaign receive £500 cash, a new Illamasqua make-up kit worth £500 and a framed photo of yourself like you've never looked before! Ready to stand up for beauty that defies age limits? For full details on the Human Fundamentalism Collection or the Beauty Before Age competition, visit illamasqua.com. I absolutely love the concept for this campaign. While I have absolutely nothing against wanting to look your best with anti-aging creams and procedures, the key word is BEST, and doing so with a sense of grace. And, it would be so great to get into a collective mindset of NOT mourning "the loss of our beauty," but rather celebrating the next stage of it, to the point where those who condescend and disagree are aware that they need to get with the times. 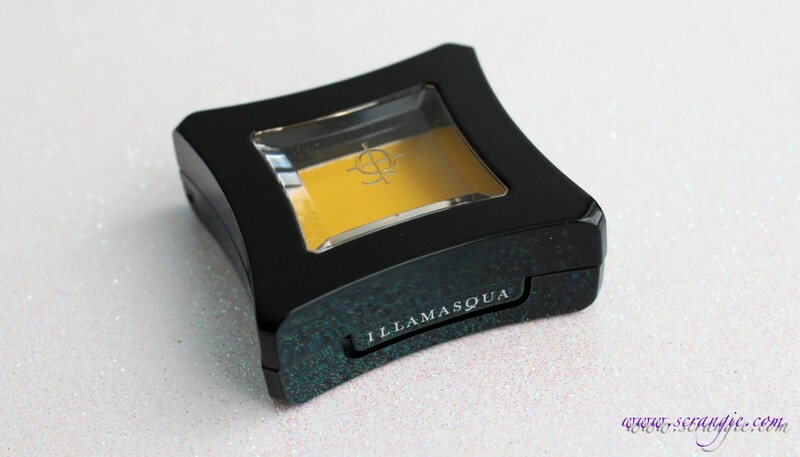 Well done, Illamasqua. I can't wait to see the finished campaigns. That's a bummer about the sheerness, they look pretty awesome in the pan. I love the way that color looks on you, too bad it's so dry. Just want to let you know that the link for the contest above isn't working, because it puts www.blogger.com before the web address for some reason. But if you delete that part it works fine, so no biggie. Pretty lip color. Plus, in past pix, pretty eyes, too. Hey scrangie, can you review the orly collection for Dark Shadows movie thats coming out soon? I already bought 3 but i would love to see your swatches and what you think of the collection. Thanks! That's a shame about the products because they look so nice. 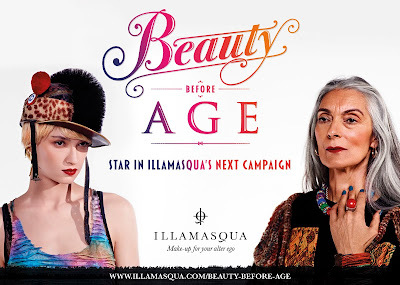 I like the idea of the Beauty Before Age campaign. People laugh, but I really hate being in my mid-30s. I feel ancient when it comes to reading beauty blogs because it seems like most beauty bloggers are much younger. And I miss my 20s. Anyway, I hope the Beauty Before Age campaign doesn't lead to a slew of those backhanded compliments like "Wow! She looks great...for her age." Those last three words drive me nuts! 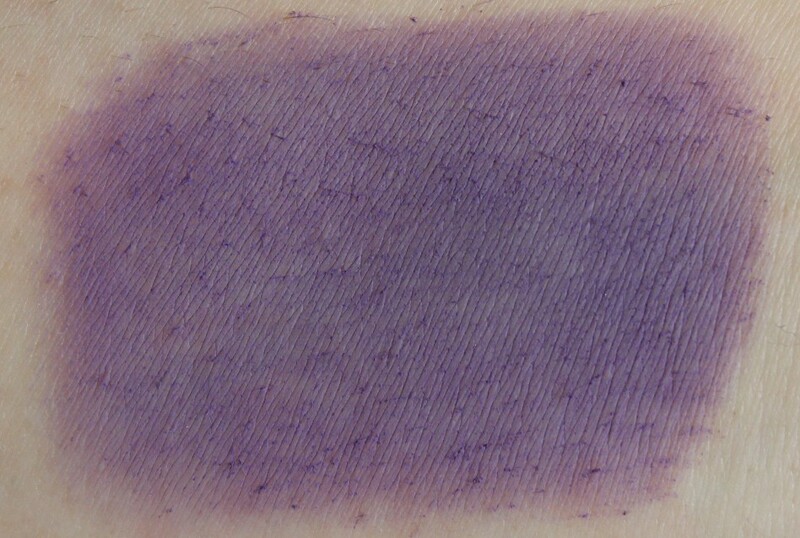 Hmm, the purple kinda reminds me of a bruise lol. And I can't imagine yellow eye shadow! Can you show it to us on your eye?? Just curious! :). Also, have you heard about the Layla mirror chrome polishes?? Oops, they're actually called Layla Mirror Effects. 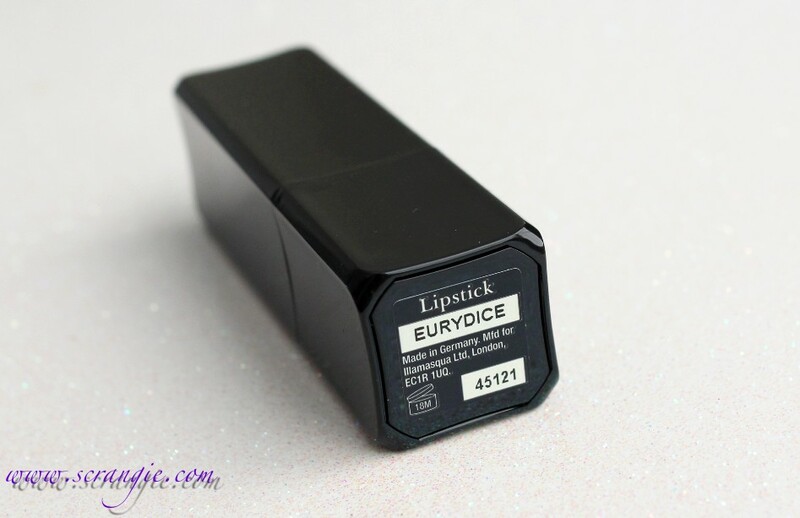 Eurydice is gorgeous on you!